The Presser Foot currently has four BERNINA Certified and trained service and repair technicians on staff. We are pleased to offer skilled and honest service and repair on most brands of domestic sewing and embroidery machines at both of our locations. We do recommend a full service on your machine every 12 to 18 months, as grease and oil do evaporate more quickly in our climate and at our altitude—even if you do not use your machine every day. 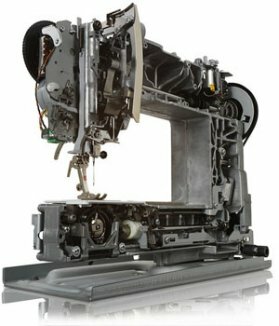 Please call us if you have specific questions regarding service or repair of your sewing or embroidery machine. to parts for most BERNINA machines (some parts may no longer be available for older models). your approval before we proceed if the cost exceeds $15. • For BERNINA machines older than 1998, please bring your foot control and power cord. BERNINA Deco, please bring a hoop for the machine with you. sample with you if possible—sometimes this is very helpful for our technicians to see. to a dealer for your brand of machine. you have any work done at a dealer who is authorized to service and repair your machine. We are happy to make a recommendation to a dealer for your brand of machine. • Foot control and power cord. • Standard sewing foot (zig zag foot). • Wide stitch plate (we must be able to stitch a zig zag—no straight stitch plates, please). • Bobbin case and bobbin for your machine. related to the embroidery unit.